The medical condition referred to as Cri Du Chat Syndrome is considered to be one of the greatest of all medical mysteries. Many medical professionals also refer to this condition as Cat Cry Syndrome. The presence of this chromosomal medical complication is considered to be quite rare, which makes it one of the most interesting medical conditions to date. Typically, doctors are able to identify the condition once a child is born. The initial symptom is most commonly a distinctive type of cry that is often compared to the sounds that a kitten or a cat makes when meowing. When it comes to medical mysteries, Cri Du Chat Syndrome is one that still remains to be the subject of tests and research today. This medical condition, as stated previously, is exceptionally rare. On each chromosome in the body, there are specific amounts of genetic information. An infant is born with this complicated condition when there is a lack of or missing genetic based information on the chromosome that is identified as “5”. One of the types of information that is missing is often referred to as “TERT”. This stands for “Telomerase Reverse Transcriptase”. This form of genetic information assists in the overall control that pertains to the growth of the actual cell. It is believed that this information plays a vital role in the development of the identifying factors of this mysterious syndrome. There are many medical professionals that believe that the medical condition may be impacted by unusual situations during the actual development of the sperm and/or egg that is ultimately responsible for the life of the infant. In case studies, it has been established that at least one parent of the infant that suffers from a condition where the chromosome that they possess that is identified as “5” has genetic information that is not missing, but simply rearranged. This is referred to in the medical community as a translocation. This information is then passed on to the child during the gestational growth and development. Out of all cases of infants born with a mental type of retardation, Cri Du Chat Syndrome accounts for at least 1%. There are many different symptoms associated with Cat Cry Syndrome. The most obvious of all the symptoms is the cry, as mentioned previously. Children that are born with this condition typically have eyes that appear to have a downward slant to them, in some cases the eyes are also considered to be wide set. It is also common for the ears of the baby to be set relatively lower than normal or to appear abnormal in appearance. In some instances, a type of webbing may be present along the fingers as well as the toes. 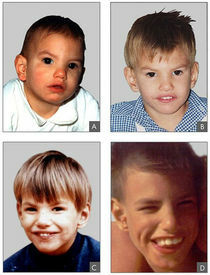 Many doctors identify the symptom of Microcephaly, which is a small head. Many identify a small jaw, which is also called Micrognathia. The birth weight of a child with Cri Du Chat Syndrome is nearly always low and the progression of growth is often very slow. When it comes to medical mysteries, Cri Du Chat Syndrome is one condition that is at the top of the list when it comes to research. Each day, researchers and doctors are working to learn more about how to prevent and treat Cat Cry Syndrome. If the condition is in the family history of a person that is considering becoming a parent, it is advised that the individual seek genetic based counseling. There are no known medical treatments for this condition, but families that must cope with this condition are often encouraged to seek counseling and learning based programs to assist in developing the skills and abilities of a child that suffers from the effect of mental retardation. There are also many support groups available for those affected by Cri Du Chat Syndrome.